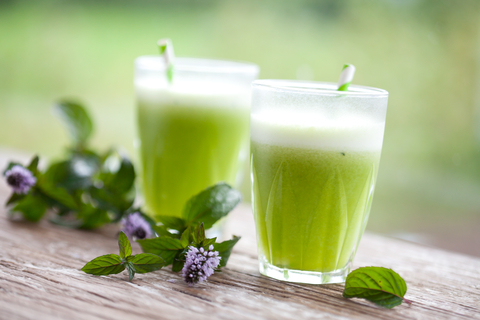 If you plan to incorporate juicing into your diet, be aware of the pros and cons. Our tips—accompanied by a sampling of easy juicing recipes—can steer you in the right direction. Juicing is, technically, a "processed" food; eating whole foods provides better nutrition. Even so, smart juicing—as in the juicing recipes within this post—does contribute to your fruit and vegetable intake. Juicing is a trendy way to prepare delicious blends of fruits and/or vegetables, but remember it’s a process that extracts the juice from fresh fruits or vegetables—which technically makes it processed food. On the plus side, juicing recipes will leave you with most of the vitamins, minerals, and plant chemicals (phytonutrients) from a whole fruit or vegetable. Unfortunately, the fiber—which contains numerous health benefits from produce (see below)—is typically lost during most juicing processes. As such, nutrition and health professionals recommend eating more fresh fruits and vegetables. Yet that hasn’t slowed down the trend of drinking them instead. The movement is related partly to hype but also to the sheer convenience of juicing and the simplicity of juicing recipes. Helping to keep the trend popular: the release of popular documentaries, among them the Joe Cross film Fat, Sick, & Nearly Dead, that tout the benefits of juicing. Although the evidence of juicing’s health benefits is primarily anecdotal, one thing is certain: Juicing recipes can help you squeeze more vitamins and minerals from produce into your diet—which is especially important for those who just aren’t veggie fans. This is an obvious advantage of the craze. After all, only about 10 percent of Americans are getting the daily recommended number of servings of vegetables and fruit (five to seven). As long as juicing is a trend, you’ll continue to see countless claims out there about its benefits. Yet there isn’t any strong scientific evidence to support the purported benefits of juicing, compared to eating fruits and vegetables. Juicing and “juice cleansing” (consuming juices to obtain nutrition while abstaining from eating food) is certainly not for everyone—especially those with medical conditions such as diabetes and various organ diseases. Juicing can interfere with some medications; for example, large amounts of foods high in vitamin K, such as kale, may alter how certain blood thinners work. Consult with your health professional before incorporating a juicing regimen into your diet. Due to the high sugar and caloric content in fruit, most juicing advocates recommend that no more than 20 percent of your juice should come from fruit. Therefore, 80 percent or more of your juice should be sourced from a rainbow of fresh vegetables, with a special focus on green varieties, as they are typically a richer source of nutrition. Avoid adding sugar and sweeteners to your juicing recipes. Do add protein—such as hempseed or nut butter—to produce a juice that’s more balanced with respect to the macronutrient profile. Juicing machines typically extract the juice and leave the pulp as waste. Don’t replace eating fresh produce with juicing—you will lose the valuable fiber found in the pulp; continue to eat fresh produce daily. 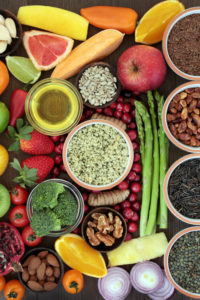 Fiber helps to support digestive health and maintain a healthy weight, and it helps to lower your risk of diabetes, cholesterol, and heart disease. According to the National Institute of Medicine, depending on one’s age, men need 30 to 38 grams of fiber per day and women need 21 to 25 grams. Eating whole fruits and vegetables is one of the best ways to achieve this requirement. Furthermore, research supports the claim that eating a plant-based diet is linked to a lower risk of heart disease and cancer, however, there isn’t any science that can back that up with respect to juicing. Juice all of the ingredients using the instructions for normal juicing in your juicer manual or blend in your blender until you have a very smooth consistency (add small amounts of water until you reached desired consistency). Chill your juice for half an hour and drink immediately. add, antioxidants, bacteria, blood thinners, cancer, carrots, cholesterol, cholesterol and heart disease, diabetes, diet, digestive, digestive health, fiber, food, garlic, ginger, health, healthy weight, heart disease, institute of medicine, juicing recipes, kale, maca, medical conditions, nutrients, nutrition, organic, phytonutrients, plant based diet, protein, recipe, risk of heart disease, spinach, sugar, vegetables, vitamin, vitamin k, vitamins, vitamins and minerals, vitamins minerals.